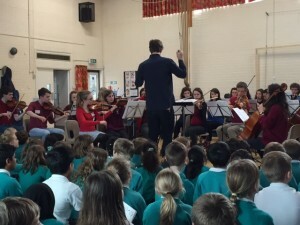 Even children who don’t have an obvious interest in classical music will have heard an orchestra before – on film soundtracks, adverts and even computer games. 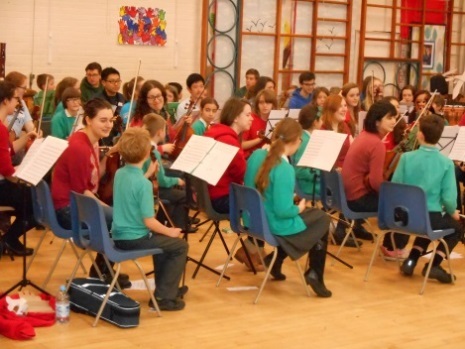 Although Southampton has an exciting and thriving music scene there are not many opportunities for children to see a live orchestra, and even less so in their own school hall! Unfortunately most full sized symphony orchestras (numbering roughly one-hundred players) do not fit into a school hall, so instead we take a smaller version, a baby version- Baby SUSO! For the past five years on Wednesday afternoons the Baby SUSO group have visited a number of primary and secondary schools in the area. 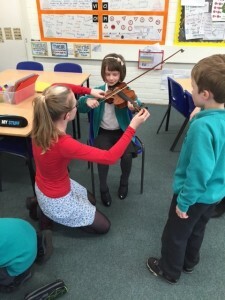 We work with a selected year group, involving them in a rotating workshop to introduce them to the different orchestral families and the instruments within them. After the school day we perform a half-hour concert for students, parents and staff. If the school has an orchestra there is also the opportunity for the young musicians to join us for a piece. Since the introduction of the BBC’s 10 pieces project in 2014, we have tried to incorporate this exciting initiative into our own Baby SUSO concerts. Therefore in addition to the popular TV and film music that the children easily recognise (such as soundtracks from ‘Frozen’ and ‘Pirates of the Caribbean’), recent concerts have included works by Mussorgsky, Beethoven, Grieg and Handel. The workshops are led by the principal players of each section, while the concerts are conducted by the University of Southampton’s finest conducting students. Each member of Baby SUSO is united in their commitment to sharing their experience and passion for the promotion of orchestral music. In the past the project has featured on regional news programme ‘Meridian’, on local radio stations, in local newspapers and in Music Teacher Magazine. We were very grateful to Southampton Music Hub for their support this year in carrying out the annual ‘Baby SUSO School’s Tour’.